We had anticipated an organized border crossing into Panama for two reasons. 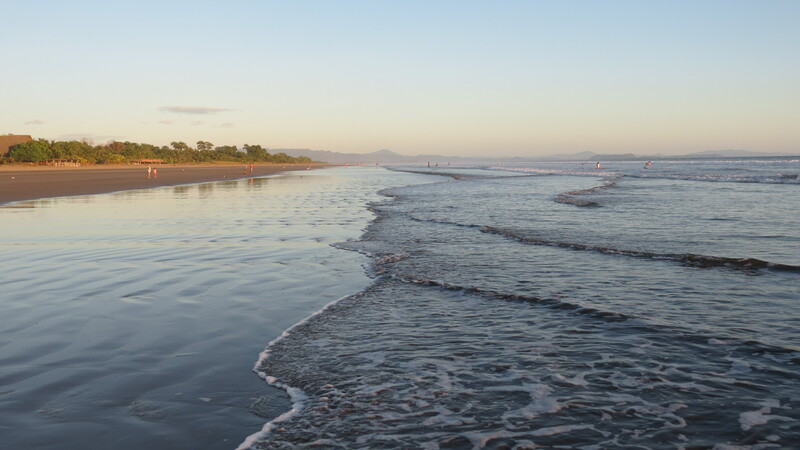 It borders Costa Rica, and it has had a lot of American influence. But our optimism was misplaced. We stamped out of Costa Rica, bought car insurance for Panama, and went through Migración easily enough. The final stop was the Aduana for the car importation. There were at least 8 officers standing out on the sidewalk dressed in navy pants and logoed white shirts. The steps were the same as we have had in other countries but devoid of order, and with many interruptions. All officials seemed to attend to all vehicles all at one time. Anyone could interrupt at any time and then all attention would turn to them. Finally when we had a sticker placed on the windshield, five officers told us to leave. Four waved for Bob to drive forward, and one directed him to backup, all waving their arms at the same time. Bob just shook his head. So like all border crossings to date, we got it done ….but it wasn’t pretty. In Panama, the Panamericana highway is a four lane paved roadway, with an average maximum speed limit of 80 km/hr. Trees dot the dry grass pastureland, fenced for grazing by whitish colored brahman cattle, whose floppy ears give them a kind of puppy dog face. A blue ridge of mountain hills to the left enticed us to head for cooler air. We spent one night in the pretty town of Boquete but found it downright freezing. It was parka weather. So we headed for the beach on the pacific coast. At Playa Las Lajas, we found a small campground and hostel, and parked at the gate until the volleyball game was over. Then Matthew, the owner, took down the net to make space for us to park on the grass. At 95 degrees, it was too hot for volleyball anyway. 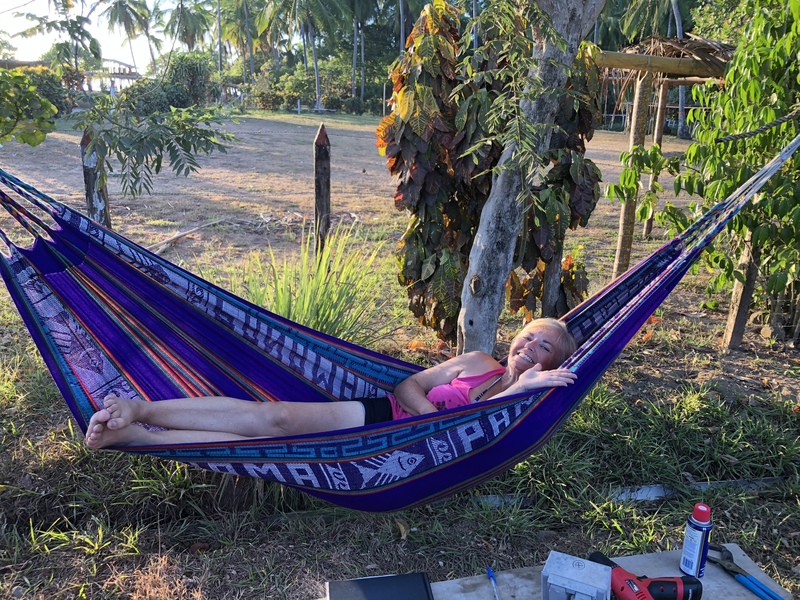 For $10 a night we had the use of a communal kitchen, an electrical hookup, and a purple hammock all to ourselves. There were two age groups, young and old. The camp group consisted of Canadians (that would be us), Germans, a Colombian and a few Americans. In the evening, locals and expats would drop in for a visit and we quickly became friends with Renate and Gunther, a German couple who own a home in the area. We had good laughs over non humorous topics like marijuana legalization in Canada, the heavy influx of refugees to Germany, and of course the ever topical Trump. Directly across the road, a 20 kilometer uncrowded wide beach of soft sand beckoned us each morning and the hot sun chased us back to the shade by noon. Each morning the lifeguards would show up, put up a colored flag and watch that no one went out too far. Strong rip tides here are common. One morning we bicycled along the beach. 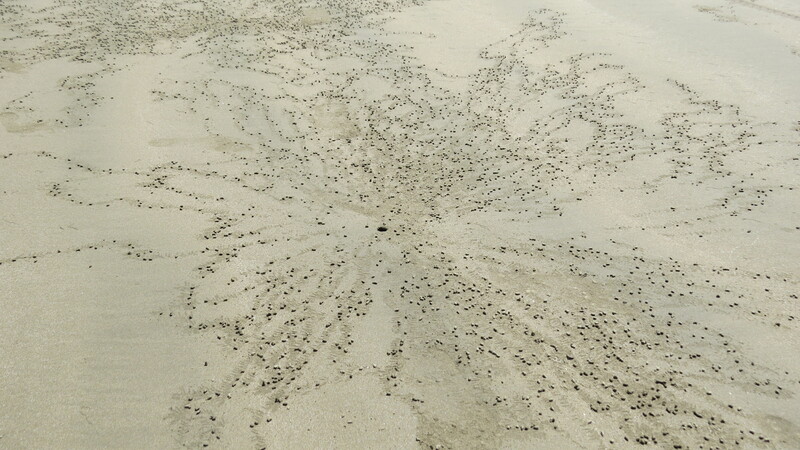 The crabs were making embroidery patterns in the sand and as we rode up they scuttled down their holes. Couldn’t get a photo but they sure could shovel up a pile of sand for being such little creatures. Late afternoon was surf time and we took a board out again. It was fun but either the heat, the humidity or the old bones caught up to us and we did not have the stamina to stay out very long. 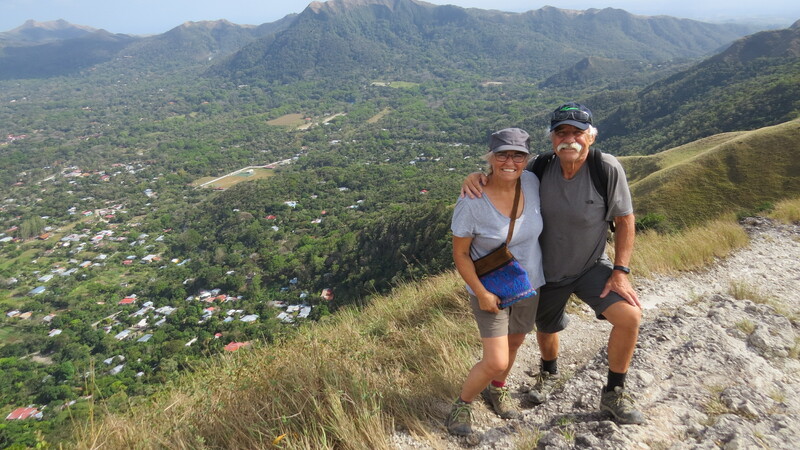 Los dos amigos, Krys and Merv, had arrived in Panama City and we had arranged to meet at El Valle de Anton, a small town nestled inside an ancient volcanic crater. The drive up the paved road offered excellent views of the forested mountain rims surrounding the town. Looking back, we could see the tower buildings lining the pacific coast near San Carlos, an hour outside of Panama City. 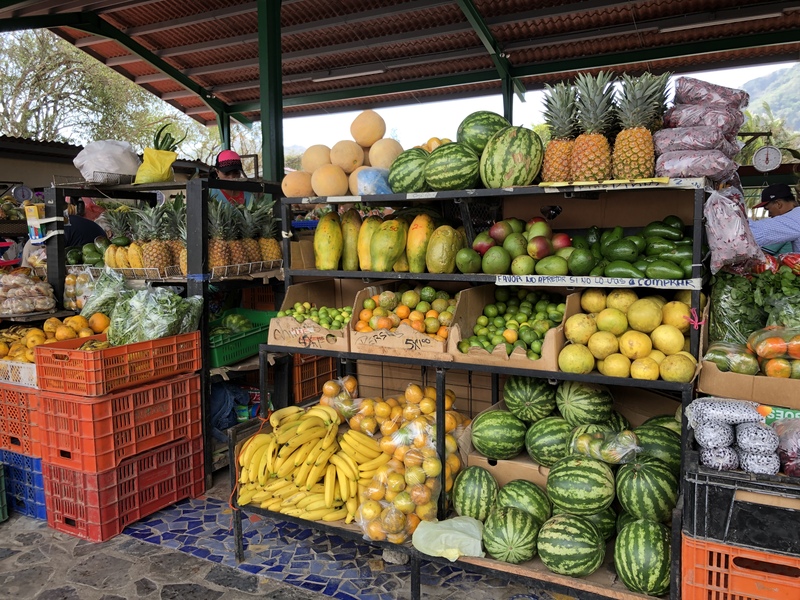 We were attracted to El Valle, population 7,000, by the friendly locals, the outdoor vegetable and artisan market, and the paved streets winding through quiet tidy neighborhoods. The air just smelled fresh. We planned for 3 nights but stayed for 6. It was not long before we learned about World Youth Day. We could hear music on the street, so Krys and I went out to investigate. It was a parade with two drummers, a saxophonist and a trumpeter, followed by about 50 young people bearing the flags of various countries. It turns out that an estimated 100,000 Catholic young people from all around the world are on a pilgrimage to Panama City. Smaller groups meet in different towns in Panama before descending on the capitol city for the Pope’s arrival on January 23. 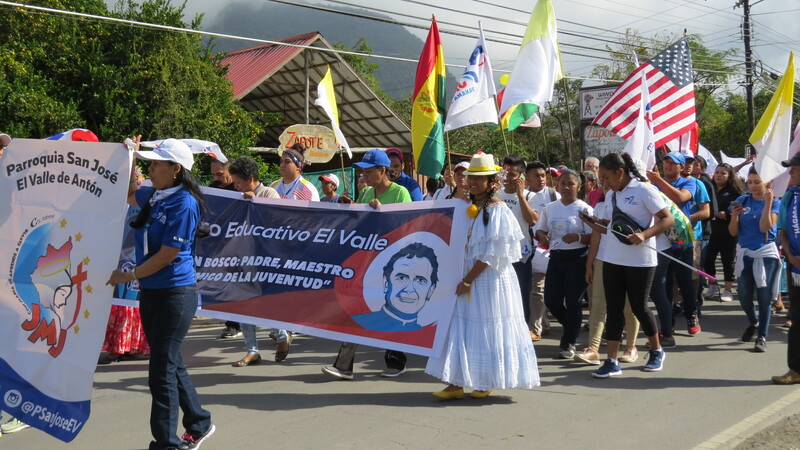 So in El Valle de Anton there was a group of pilgrims from countries such as USA, Switzerland, Poland, Bolivia, and Panama celebrating their journey to meet the Pope. 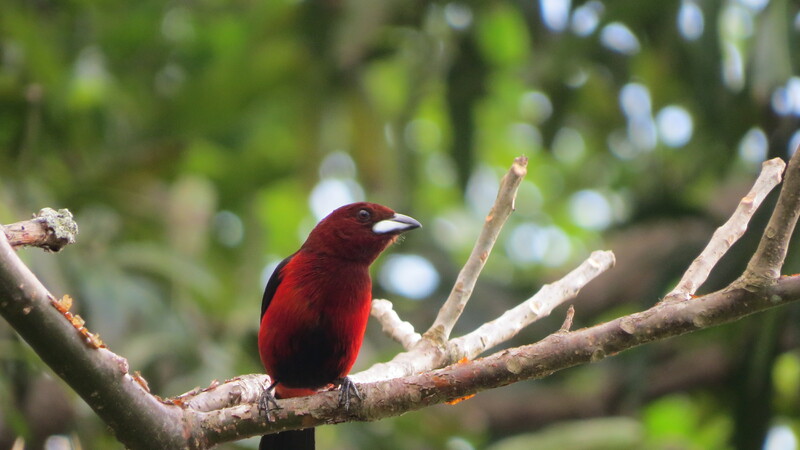 There are many opportunities to experience nature in El Valle. Wild orchids grow in abundance, but we did not see many blooms as it is not their flowering season. 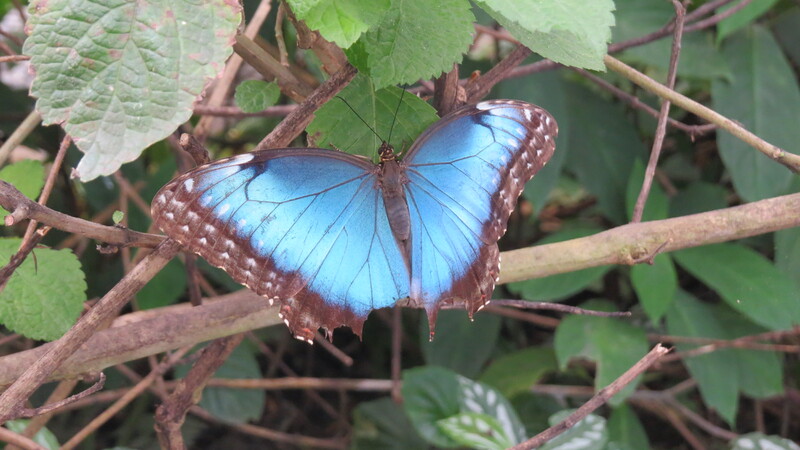 We spent time at the Butterfly Haven which raises over 20 species of butterflies while providing an excellent educational session for the public. It was a beautiful little place exploding with plants, flowers, and flitting butterflies. We spent a good while trying to photograph their colorful open wings, saw how the eggs were deposited on the leaves, and stroked the soft backs of three different types of caterpillars. I was intrigued to learn about a small species of Monarch which does not migrate, but stays in Panama year round. The center hopes to raise awareness about the dangerously declining butterfly populations, primarily caused by habitat loss and air pollution. 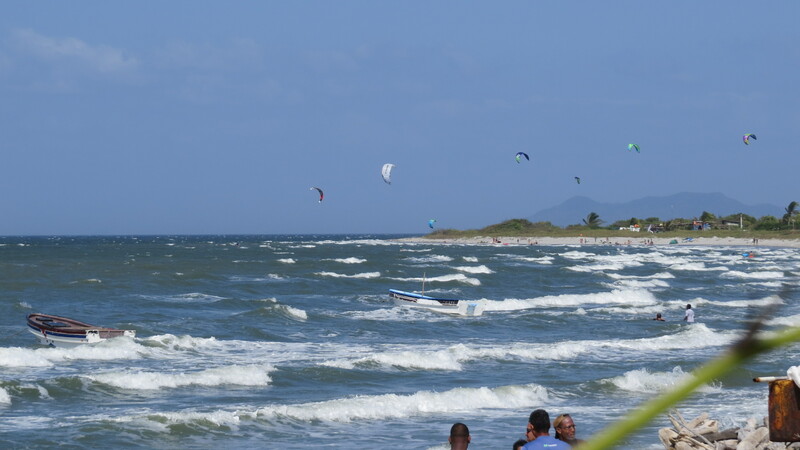 One afternoon we drove to the coast, then down a long road on a small finger of land to Punta Chame where we watched kite surfers, harnessed beneath multi-hued rectangle kites, fly over the rough waves. 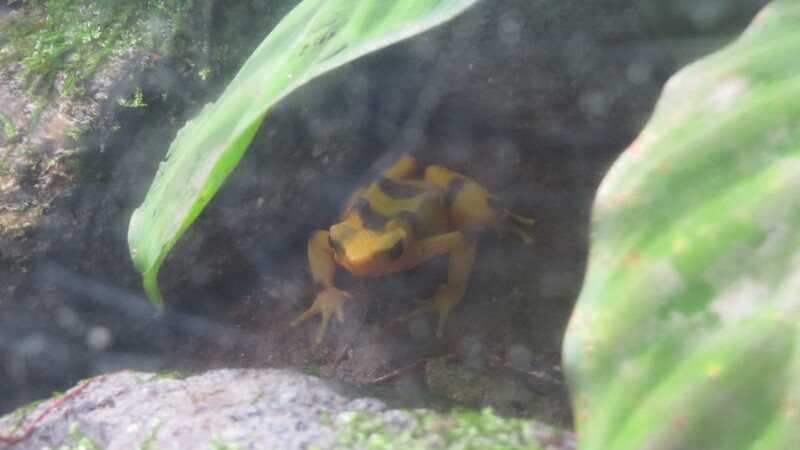 Another afternoon we wandered around the small zoo at El Valle de Anton, with the highlight for me being the Golden Frog. Bright yellow with black spots, it is national symbol of Panama, but was last seen in the wild in 2009. There is an Amphibian Conservation Center here, where a breeding program keeps the species alive, but a fungal threat means they cannot yet be returned to the wild. 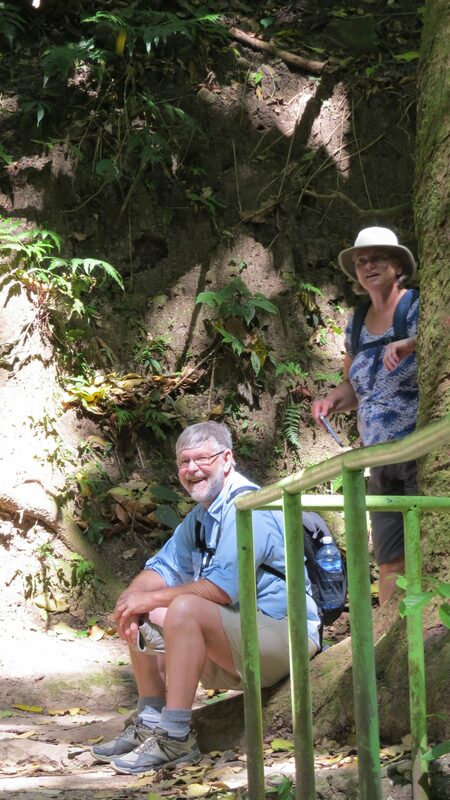 A hike up to the volcanic rim took us on a path which followed along a mountain stream. At times it cascaded over rock faces, pouring into small clear pools of water, where local teenagers spent a splashy afternoon. We watched some young people taking turns rappelling down a waterfall. 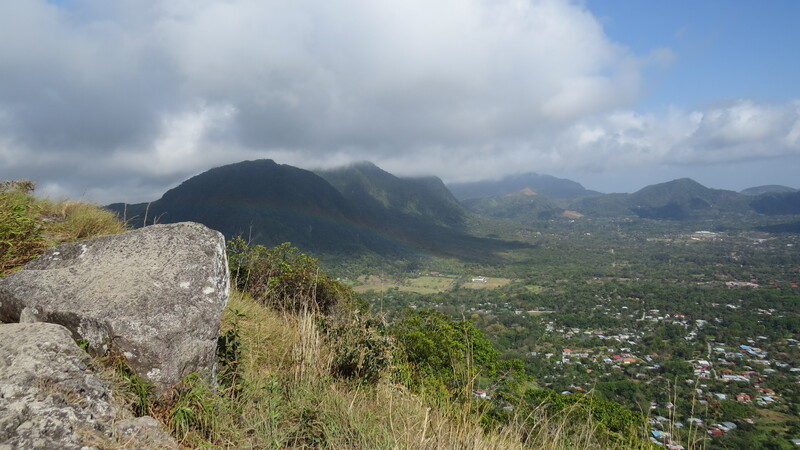 Many locals are descendants of the Guaymi Indians, some of whom live in small houses near the mountain top, selling fruits and vegetables out of woven baskets, to hikers along the trail. The last 5 minutes of the climb were a difficult rock scramble, but worth the effort. We were rewarded with spectacular views over the forests and mountains with tiny houses way below. For a few minutes a rainbow appeared beneath us. The wind was fierce. 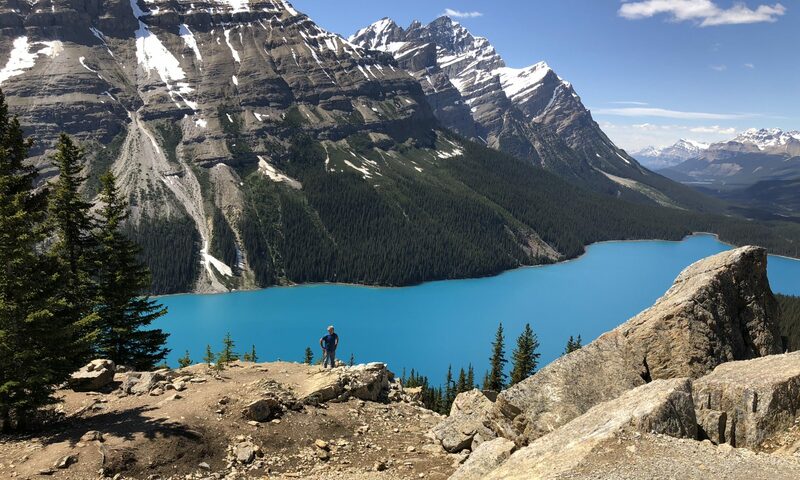 So strong that when trying to take a photo of Bob on a higher peak, the camera could not even be held steady. We met a group of Polish youth at the top, loudly and boisterously celebrating their successful climb. The four of us had leisurely mornings with coffee on the tiled terrace and cooked suppers in the large kitchen whose electrical appliances were in various stages of working order. One night we picked a Spanish restaurant and headed out to find a taxi on the street. True to our Canadian impatience standards, when a taxi failed to show in the first five minutes, we started walking. Eventually a taxi did come by, we got in, and he promptly turned around and drove the other way. It would have been a long walk in the wrong direction. The hosts owners of Don Quijote were very welcoming and talkative, having arrived here from Spain only 4 years ago. We noticed a lot of flames coming from the kitchen and the much anticipated paella did not disappoint. Our hosts spoke only Spanish but la mujere proudly said the word spoon in English and told us that she had been studying the language. We could all relate to that feeling of success when a foreign word finally sticks in your head. We had great food, good Spanish wine, and a lot of fun. By the end of the evening we were taking group photos with the hosts and their friends, with hugs all around. 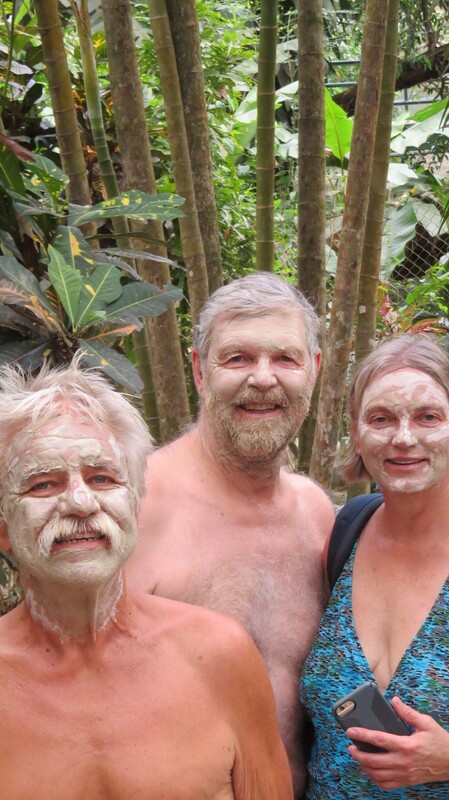 On our last day together we went bicycling around town, and stopped in at the hot pools for a mud facial. Then we bicycled off to find the Golden Frog Restaurant for lunch. It was at least an hours ride uphill, with Bob insisting it was downhill. We knew he was wrong when it took us only 7 minutes to get back home. The Plan. Say a fond farewell and happy travels to Krys and Merv as they head home to Canada. Get mega photocopying done for the many appointments required in the process of having La Vanna shipped to Columbia. First stop is a police inspection to ensure she is not a stolen vehicle. This in itself takes one whole day. Wish us luck, as we will need it.